Hello music video aficionados! It’s Andy Gesner and the staff from HIP Video Promo, here with a new clip from a compulsively danceable indie rock band. VHS Or Beta has been straddling the divide between the dancefloor and the rock and roll stage for the better part of this decade. Over the course of three critically-acclaimed albums and several EPs, the Kentucky quintet has defied genre conventions and delivered infectious, novel, and thoroughly unclassifiable pop. Every groove they play is steeped in rock and roll swagger, and every rock track they cut is as propulsive as the best disco records. Early in their run, the band was frequently compared to Daft Punk, but they’ve matured into something more like a stateside version of another French act – their Astralwerks labelmates Phoenix, whose commitment to sophisticated and artful pop VHS or Beta shares. Much credit for this successful fusion of arena rock, dance music, Europop, and techno must go to the group’s accomplished rhythm section. Drummer Mark Guidry and bassist Mark Palgy are elastic and ingenious, they’re masters of many styles, and they’re unafraid to counterpose traditions and take aesthetic risks. As interpreters of frontman Craig Pfunder’s writing, they couldn’t be better: they put the hard edges on the slinky grooves of the debut Le Funk, and charged through the dizzy followup Night On Fire. 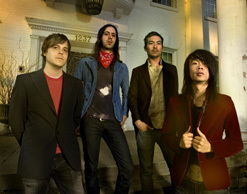 The title track of the sophomore album appeared in films, videogames, and The OC, and got electrifying remixes from Cut Copy and Carlos D of Interpol. VHS Or Beta took to the road in support of Duran Duran, and closed 2005 as some of the nation’s best known dance-rock revivalists. For Bring On The Comets, their latest effort, VHS Or Beta has chosen to emphasize the “rock” elements of their musical personality. That’s not to suggest that it doesn’t move: on the contrary, no matter how fiercely pianist Chea Beckley and guitarist Mike McGill play, these mixes still shake. “Can’t Believe A Single Word” is the anthemic centerpiece – a track studded with power chords and blessed with a gigantic chorus hook. Pfunder sounds just as tough as the six-strings do, and here his powerful voice carries a melody so catchy you’ll be singing it in the shower for weeks. Greg Foley’s beautifully-shot clip for “Can’t Believe A Single Word” follows the quintet into the desert – a place where bright sunlight and strange shadows can create some intense hallucinations. The departures from standard reality begin simply enough: as the members of VHS Or Beta perform, the desert dust they kick up flies in reverse. But as the video progresses, Foley and the band have some more provocative tricks to play on the viewer. A woman dressed exactly like Pfunder casts aside a guitar and hurls her text messenger against a rock (again the film runs backward for a second, and the shattered Sidekick comes back together in midair.) For a second, it appears that she’s part of VHS Or Beta – but when she rejoins the band, it’s clear that it’s the group that has somehow changed. All five members of the group are now women. Because they’re playing the same instruments and dressed in the same clothing as the bandmembers, it may take you a few seconds to recognize what happened – and by then, Foley is done with his subterfuge, and the original quintet is restored. VHS Or Beta is just playing with your mind, pushing you when you’re most susceptible, prompting double-takes, arresting you, pulling you closer to the strange dream they’re generating. Big thanks to Justin Nichols and the Astralwerks promotional team for brining us on board for this incredible video. They’ve hooked us up with lots of copies of Bring On The Comets, so let’s bring on the CD requests for on-air giveaways! Or let us know if you’d like to catch up with the band for a video interview when their fall tour brings them to your town! We’ll be sure to hook you up with everything you need. If you need more info call Andy Gesner at 732-613-1779, or email HIPVideo@aol.com. You can also visit www.Astralwerks.com or www.VHSorBeta.com to find out more about VHS Or Beta.